VP2000 Quick Connect Pump Accessory is rated 4.4 out of 5 by 17. Rated 4 out of 5 by Ron2 from VP2000 This is is just what we needed. I tested the pump this weekend and it worked great. One problem is that the permanent adapter leaked. I had to use plumbers tape to seal the leak and it also leaks from the wet vac cap. I replaced the screw with a plat end machine screw because it puts a hole in the wet vac. The durability can only be tested after a period of usage. Rated 4 out of 5 by johnblaze from I'm truly happy with this product I love your product because it is very easy to use very durable and has very good precautionary measures so I can even let my mom use it without worry that you'll be armed or that I can give it to other employees and it's easy for them to use and safe! Rated 4 out of 5 by Wetbasement from It certainly beats dragging the vac outside and across the lawn to empty it. Bought this because connecting a hose that is run outside and across the lawn is a lot easier than dragging the whole machine out there. It also empties it a lot faster, so you can get back to work. Rated 5 out of 5 by FLFamily from Beats having to manually empty the water out of the shop vac Bought this pump to help remove the water that remains in our driveway after a large storm. The convenience of filling the shop vac then emptying through a garden hose is awesome! Saves our back and makes removing the water a breeze!! Rated 5 out of 5 by Ewhamo from Great little pump would defiantly recommend sure beats many trips to dump water from vacuum. Very easy to hook up and use. Used it all day removing standing water from basement. Will this pump discharge water while vacuuming? If so will it keep up with the volume of water the vacuum picks up? Take it to a Home Depot near you that repairs tools. Along with your paper work, purchase receipt, etc and they will handle the repair for you. Good morning. 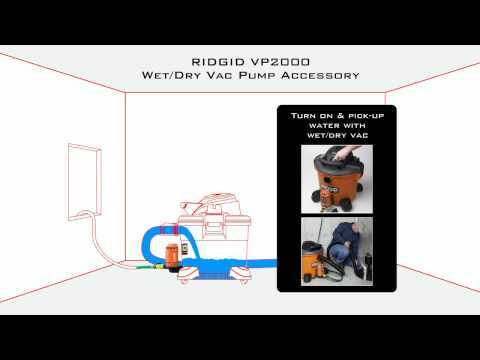 I bought a RIDGID Wet/Dry Vac 6 Gal vacuum cleaner to drain water from a jacuzzi. If I buy a pump where do I connect that pump to my 6 Gal wet/Dry Vac (Model: 0671)? Your video shows an extra hole below the inlet hose area. My 6 Gal does not have that extra hole? So where do I connect the pump? Is this pump covered by RIdgid&rsquo;s warranty? Hello braniams, VP2000 pump accessory has a lifetime warranty against defects in workmanship and material. Any failure due to misuse, abuse and normal wear and tear are not covered. If you need assistance concerning the warranty, call us at 1-800-474-3443. Where can I get the adapter that comes with the pump? Part number 828952. Can not find a single reference to this adapter. Is it available anywhere?